One of Prince Albert’s most loved and respected teachers, Jackie Afrika, is leaving town after 19 years to take up a position as head of arts at her old high school in Malmesbury. Jackie is best known in Prince Albert for her incredible work with the Prince Albert Primary school choir which has sung at virtually every major wedding, funeral and other celebration in the village for the past 10 years. It will continue now under the guidance of PA Primary teacher Emmie Willemse. Home will be Schoonspruit High School in Malmesbury where she and Cyril met in grade 11 in the 1970s. The couple married in 1986 after reconnecting as students at the University of the Western Cape (UWC). Jackie’s mother Paulina and many of her family still live nearby as do many of her childhood friends. “These are people who I haven’t seen in two decades. There are so many friendships I would love to renew,” she says. Jackie and Cyril were called to Prince Albert by the Church in 1989. She immediately took up a post at PA Primary where she taught English, music and needlework. Jackie has a reputation of being a hard taskmaster and confesses that once children have joined the choir “they can’t leave”. “Once they say they want to be in the choir I insist they stay,” she says. “They have to learn commitment and discipline.” These are values that reap huge rewards for the children who almost all have succeeded in later endeavours. “My choir children are the ones who go on to study further,” she says. Jackie’s musical ability she credits to her upbringing in the Moravian mission at Elim. “It was a legacy left by the German missionaries,” she says. “Everyone in the community can play several instruments.” Jackie plays the piano, guitar and recorder. Her formal training was expanded when she studied a music teaching degree at UWC. Her children Nomsa, 20, a 2nd year medical student at the University of Stellenbosch and Joshua, 16, a pupil at the Cape Academy of Mathematics, Science and Technology are both musical. Also in the family is 16-year-old Pietie, a “house child” who Jackie loves as if he were her own. Pietie, from PA, is with Joshua at school. Both boys are part of the SA Airforce’s Young Falcons, where they are training to be pilots. Jackie says some of the credit for the success with the PA Primary choir must go to community leader Neville Claassen and the school’s cultural committee. 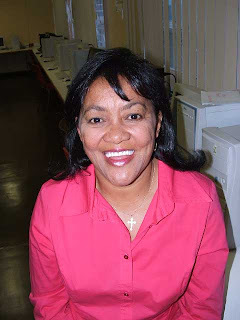 There is no question this remarkable teacher has left a legacy in our Karoo community and that the voices of the PA Primary choir will continue to bring tears to the eyes for many years to come.